How did D\' Originals pilot fare in AGB ratings? How did D' Originals pilot episode fare in AGB ratings? In the pilot episode of D' Originals, several catfights were already seen: (left frame) Jaclyn Jose slaps Katrina Halili after the latter threw kare-kare at her clothes. (right frame) Meg Imperial and Kim Domingo pulled each other's hair after Kim's character caught Meg kissing her husband, played by Archie Alemania. GMA-7's new afternoon offering D' Originals aired its pilot episode yesterday, April 17. This new dramedy produced by GMA News and Public Affairs features Jaclyn Jose, LJ Reyes, and Kim Domingo as the legal wives. Katrina Halili, Lovely Abella, and new Kapuso Meg Imperial portray the mistresses in the story. 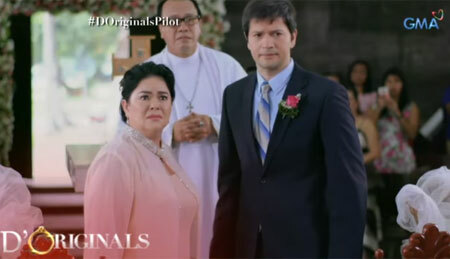 D' Originals opened with a wedding scene where the characters of Josie (Jaclyn) and Lando (Jestoni Alarcon) renewed their vows. Before the wedding, Sofia (Kim) caught her husband Art (Archie Alemania) and his mistress Alice (Meg) making out inside a car. Marge (LJ) was also outraged when she saw her husband Caloy (Mark Herras) holding the hands of Cristina (Lovely) while walking. In the middle of the wedding, Lando's mistress Yvette (Katrina) crashed the wedding and created a scandal. The back story of Lando, Yvette, and Josie that happened six months ago was shown to viewers. Josie and Lando have two children: the big brother Tim (Mikoy Morales) and the youngest Macy (Chlaui Malayao). Josie decided to open an eatery business. Apparently, Yvette previously owned the place but was evicted because of debt. Yvette created a scandal in the eatery and earned the ire of Josie. Little did Josie know that Yvette will eventually become the mistress of Lando (Jestoni). AGB RATINGS. How did the pilot episode of D' Originals fare based on AGB NUTAM (Nationwide Urban Television Audience Measurement) ratings data? D' Originals, which is directed by Adolf Alix, Jr., registered an AGB rating of 5.8%. The pilot episode of this new Kapuso show aired from 4:18 p.m. to 5:10 p.m. Meanwhile, its competitor The Greatest Love, which aired from 3:59 p.m. to 4:50 p.m., got a TV rating of 5.3%. TGL's figure is 0.5% lower than D' Originals. The Greatest Love, which stars Sylvia Sanchez, Dimples Romana, and Joshua Garcia, is down to its final week of airing on ABS-CBN.